A pole building is under construction for a new business, Haber Tire & Auto, LLC, just southeast of the Alco store along Highway 39-14 in Albion. 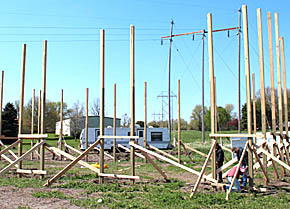 Joel Haber and his sons are building the 45 x 72 foot structure with a goal of completion this summer. The business will offer truck repair, tires and other services.